"This is the story of a cover-up, manipulation, and the subversion of justice, and it is a true one in a world where true stories often don't have happy endings. But one conclusion seems clear: the DOJ, Democrats, and some establishment Republicans are all on the same team. One where insiders go along to get along." Luke Rosiak has done an incredible job piecing together how congressional Democrats did everything within their power to protect their victimisers -- the Awan brothers -- and how entrenched Republicans let them get away with it in a self-serving effort to preserve their power and the status quo. This story needs to be told in book form. A lot of the facts detailed in this story I've read in Rosiak's work published on The Daily Caller, but it never landed for me the way it did as I read through the book. Rosiak covers a lot of players and a lot of events over the course of his two-year investigation, but he guides the reader effortlessly in a narrative that reads like a spy novel. This is a must-read book for anyone looking for a behind-the-scenes expose on how the Swamp subverted justice to serve their own interests. The more people that know the truth, the better. You should not read this book because it happens to support conclusions that are useful to Trump. You should not avoid this book because notables who like those conclusions because of their specifics have endorsed it. You should read this because it is your responsibility to be advised of, and if you choose, fix these problems under Article 1 of the Constitution. Because the House is closest to the People, the burden of oversight and the check on its power is ultimately with us, theoretically enabled by a free press. Yes, Luke Rosiak works for a right leaning outfit and doesn't hide his own views in this book. But, the ENGAGING and SHOCKING narrative of this book stand solidly on fact and sound journalistic practice. Luke writes with surprising empathy to the Democratic victims and staffers, who are clearly in a massive political bind. It is the lack of diligence, the lack of courage, and the willingness to turn a blind eye in the interest of the swamp by REPUBLICANS that drives all of the poignancy of this story. Some spoilers: Luke doesn't draw any conclusions about whether the deep state within the FBI and the Swamp staff are colluding. He simply doesn't have the data. Likewise, the impact to national security of the Awan breach goes unplumbed-- apparently by anyone. In Washington, even the temporary alignment of political and personal interest can create strange bedfellows. Maybe that happened here, when Republicans not wild about Trump, staffers desperate to protect the interest of members without ever even considering the broader national security implications, and a Blue Wall which formed to hide a dropped ball on what ultimately was revealed to be a case of importance came together in BREATHTAKING suppression of action that should have been taken in interest of the public? Many are frustrated that the Awans escaped justice and that whatever DWS was hiding was never revealed. But the most important chapter here is the epilogue. This is not a story about suppressing an incident but quietly cleaning up. In the end NOTHING changed. 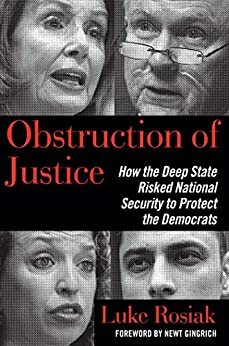 Whether because of petty personal power, or to protect crooked politicians who remain at risk from other Awan types who are still on the network, the swamp and their press enablers successfully made the whole thing completely go away -- if it were not for this book. 98 people found this helpful. Obstruction of Justice may be the most sweeping portrait of deception and corruption to occur in Congress. Not only does Luke pull back the layers of an extensive cover-up, but he unabashedly walks into the fire to reveal who has had what part in perpetrating this gross miscarriage of justice. The story lays a rich groundwork for a years-long investigation that largely stayed in the shadows and displays reporting at its finest. I have yet to read a more comprehensive job at highlighting how the deep state operates. This will be an eye-opener, not only for anyone who is naive enough to believe that government is always working for the people, but for the average American with a healthy dose of skepticism. 5.0 out of 5 stars5 Stars for Luke Rosiak's book! A multifaceted look into the mechanics of the corruption embedded in the United States government at every level. Luke's book provides the hidden rationale behind why justice is not blind. I read this book in three days, quite a feat given it's over 300 pages, it was mid-week and I'm a busy guy. Well written, edge of your seat stuff. If you ever had any doubt that our political system is corrupt, this book will fully erase it. The level of self-preservation of the "servants" in our political system is epidemic, and there are more cowards in our house of representatives then not. Even the members not directly involved in this treason were more than happy to protect their political counterparts across the isle in a warped display of alliance. Democrats and Republican voters alike should read this book carefully and decide to start reading between the lines of what their representatives seem to be up to. If this book is any indication of their true behaviors, we're getting royally screwed. All we can hope for is that the POTUS is actually able to drain that swamp, because it desperately needs to happen. All that's left to do in the meantime is pray that it does happen, for the sake of our country and our grandchildren.